A wet one forecast today for Nick and Danae's wedding at Allerton Castle in North Yorkshire. The day started at nearby Rudding Park where Danae and her bridesmaids were preparing for the big day with hair and make up before moving onto Allerton Castle just before Lunchtime for the finishing touches. 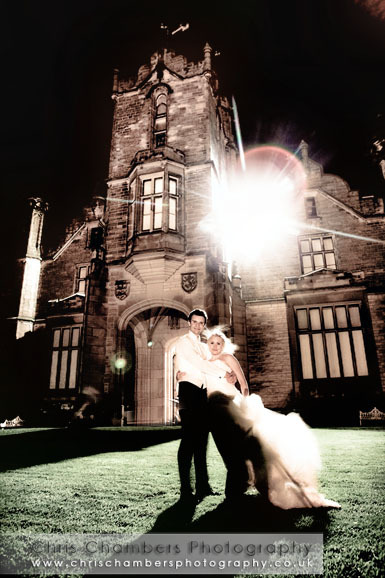 With a civil ceremony in the fantastically grand main hall, Dane and her mum swept down the staircase without so much as a stutter to the very apt lyrics of 'Going to the castle and we're gonna get married' a slight twist on the song 'Chapel of Love'. 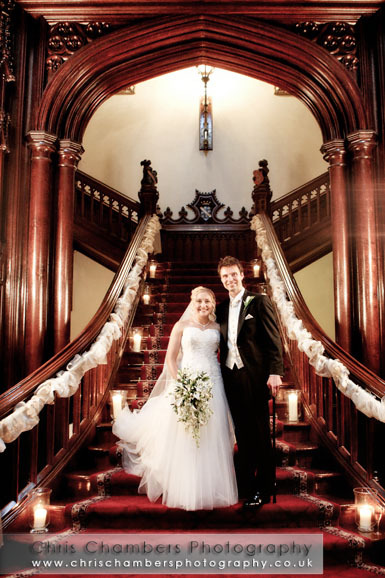 (Every Allerton Castle bride knows, getting down the main staircase makes them more nervous than the actual wedding itself!). During the ceremony Chris the best man stood to deliver the rings and performed the usual tapping of pockets and shrugging of shoulders before winking, turning around and whistling whilst holding out his left hand which had acquired a falconers glove. 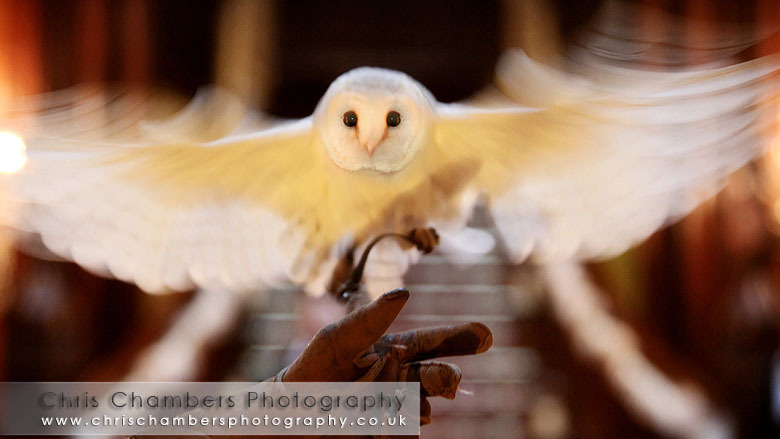 On his command a white Barn Owl swooped down from on high flying low down the aisle to deliver the rings, a great surprise for the guests and especially for Danae. Thankfully I was aware of the event and so was ready to catch the moment for the wedding album. With the rain beating down we were forced to shoot indoors for a while, however a slight let up at around 9PM allowed us to quickly venture outside for a few photos of Nick and Dane and the bridal party. Following a few after dark photographs just before eleven I bid Nick and Danae farewell and wished them well on their honeymoon to Kenya. Lucky so and so's! The following features a selection of the sixty or so images we used on the big screen playing during the evening reception. (I've added the after dark ones to complete the day).